The ultimate sound therapy instrument! Carriage: Due to this instrument's size and weight, carriage cost will vary with destination. Please Note: As these instruments are made to order and due to currency exchange fluctuations, there may be a difference in the current price to that displayed. Please contact us before ordering. 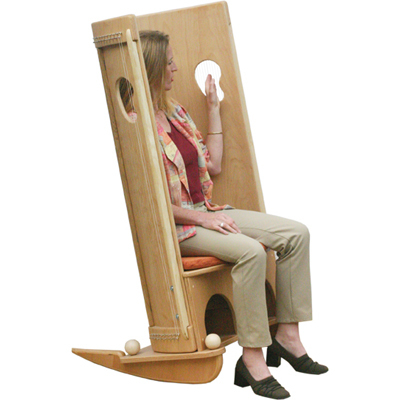 In this rocking monochord chair you can rest a little.... sit down, relax and enjoy the sound massage. Play all the strings lightly or pluck single ones with your finger tips, it's easy to learn. Through the ear shaped cut-outs you can play the strings from the inside or let somebody else play for you. The sound cradle is the synthesis of furniture and instrument, beautifully made in Germany from birch, beech and ash wood. As a monochord rocking chair, or remove the rockers for a static monochord chair or remove the seat for a sound cradle. As a sound cradle it can be placed on a table or on the floor, and gently rocked from side to side, or even turned upside down to form a tunnel for small children. Size: 140 x 75 x 50 cm. Supplied with terracotta seat cushion. Other designs are available to order, please ask us for further details.